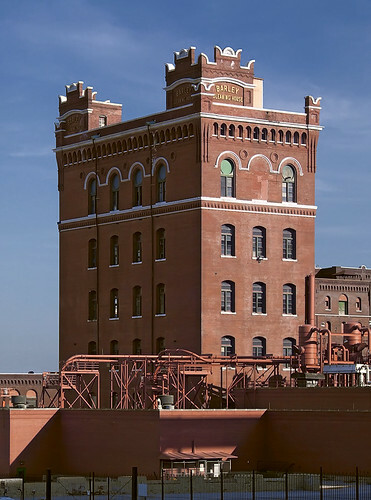 THE SOUTHERNMOST quarter of Saint Louis' Soulard neighborhood is covered by the massive and venerable Anheuser-Busch Brewery. 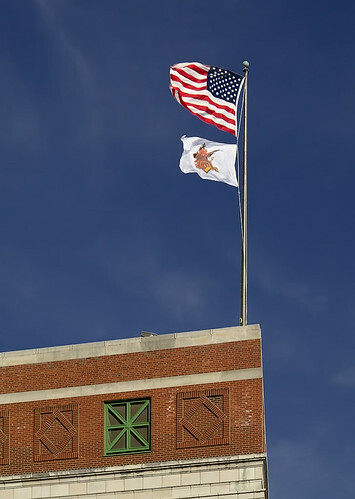 This, the largest brewery of the largest brewer, holds pride of place among the businesses in the city's south side. 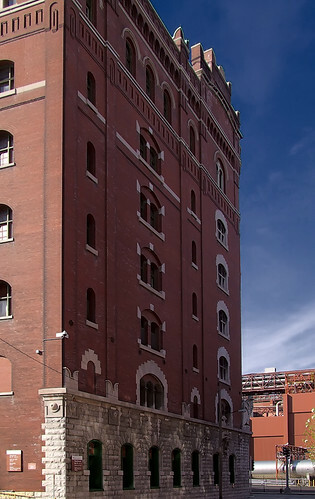 A commercial brewery has existed on this site since the 1830s, founded by German immigrants. Beneath this land are numerous caves, where the beer was kept naturally cool. It is also close to the river, a convenient source of plenty of water. 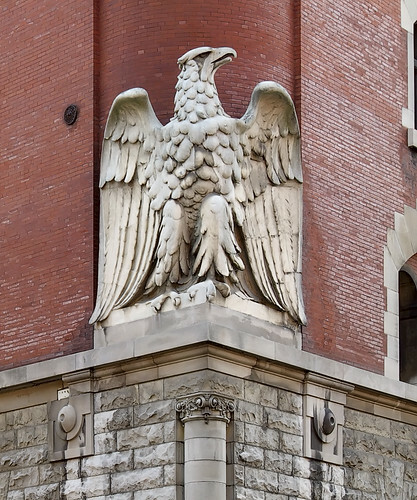 In 1857, soap-maker Eberhard Anheuser purchased the bankrupt Bavarian Brewery here, and in 1865, brought his son-in-law Adolphus Busch into the business, who quickly took over management, leading to enormous growth. Following the devastation of the War Between the States, people started moving West again, and Saint Louis remained a hub of trade and transportation to places beyond. 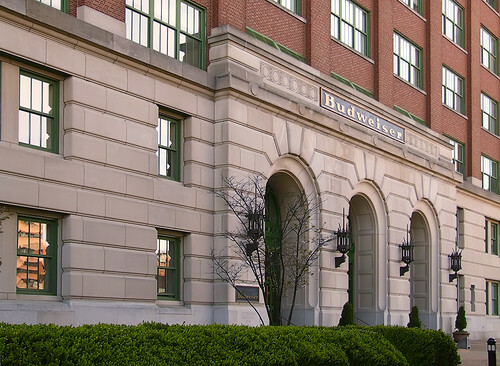 The Anheuser-Busch Brewery, taking advantage of the new technologies of Pasteurization, artificial refrigeration, and rail transport, was able to economically ship large amounts of cold beer to the western United States. Perhaps the increasing availability of beer, a mild beverage, helped tame the Wild West, which until that time slated its thirst on hard liquor. About 137 buildings on 142 acres comprise the brewery. 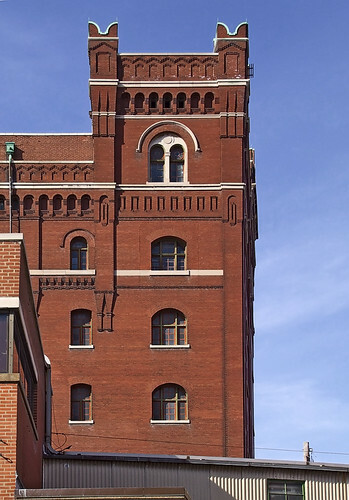 Many of the buildings date from the late 19th century, and are made of brick in the "Brewery Romanesque" style. A-B was a company founded by immigrants; it hired immigrants, and sold its products to immigrants. When these Europeans brought their love of beauty and their artistic ability to our shores, they built a brewery that has great charm and a delight to the senses. Even the fragrance of the brewing beer is wonderful. A hard-nosed businessman would have no use for this nonsense. What is beauty and delight, he thinks, over utility, efficiency, and profitability? But one needs only to travel a few miles to the other side of the river, to see vast blasted landscapes of utilitarian industry, now long bankrupt, and sitting empty and rotting. Anheuser-Busch still stands, though weakened. Beauty, though not the greatest good, is still transcendent, and exceeds in value the merely worldly prudence of efficiency. 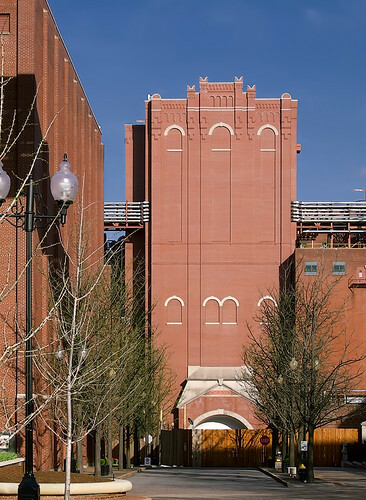 Eventually, the strictly utilitarian style of American industrial architecture inspired the Europeans, who thought that American grain elevators had an ideal aesthetic for the Machine Age. 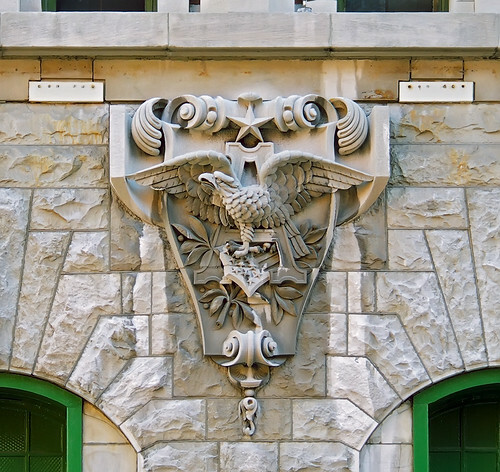 Transported back to the United States, this new kind of iconoclastic architecture overwhelmed all local and traditional styles, even at this brewery. Ironically, some structures here built in the Modern style were the first to be demolished, since they were embarrassments, fashionable for only a day. 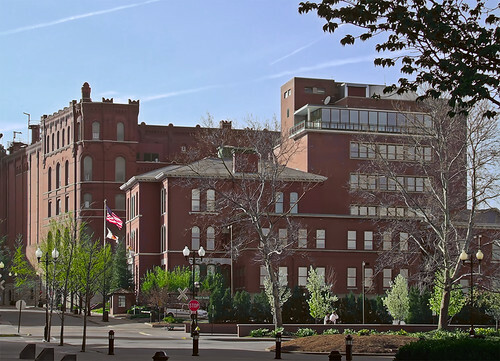 Prior to the implementation of the Civil Rights Act of 1964, Anheuser-Busch was one of the few major local employers that would hire Catholics, and consequently it still had a Catholic culture (although sharply declining) when I worked there. Black smudges on foreheads were seen everywhere here on Ash Wednesday, and Good Friday was a corporate holiday. Ah, the false promises of the 1960s; Catholics were to leave their Ghettos and become lights to the world; rather, the world crushed and subverted the Faith, to the world's detriment. At one time, just about the only way to get a job at A-B was if your father worked there. Since that time, the company has become more similar to other American businesses, first in becoming more utilitarian with money becoming the summum bonum, or Greatest Good; and second in accepting the culture of marxist class conflict: women vs. men, labor vs. management, young vs. old, minorities vs. whites, and so forth. Employees, at one time, were fiercely loyal to the company and to each other, but this was snuffed out by the modern business environment. My friends who still work for the company find the current environment there rather unpleasant. The loss of a good corporate culture has its consequences: why should anyone remain loyal to buying the company's products? Beer becomes just one more anonymous commodity. 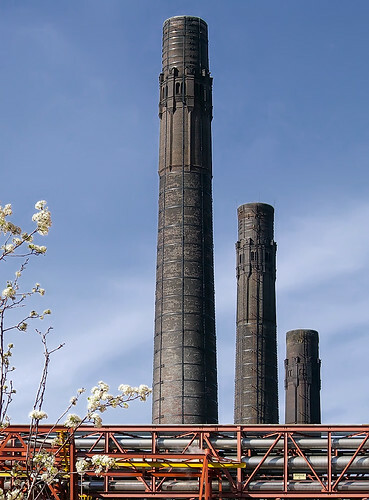 Even the smokestacks are decorative. 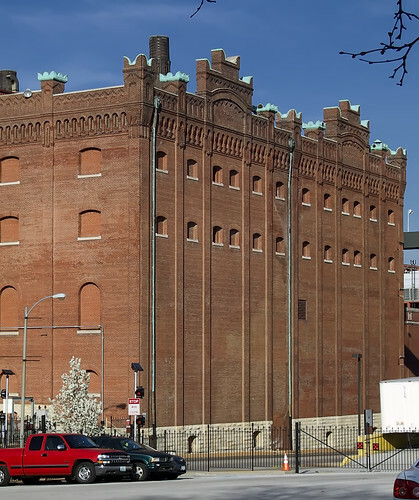 The City of Saint Louis sees this brewery as a cash cow, and milks it for tax dollars at every opportunity. Quietly, the company has been moving its office staff to anonymous office buildings in the suburbs, thereby avoiding the city income tax. This harms the city, and it also harms the company, for its employees lose their direct, daily connection with the product made. How much better would the city be, economically and culturally, if many more employees called the City their home? But as voters, they would place the current government in peril of losing their elected offices. 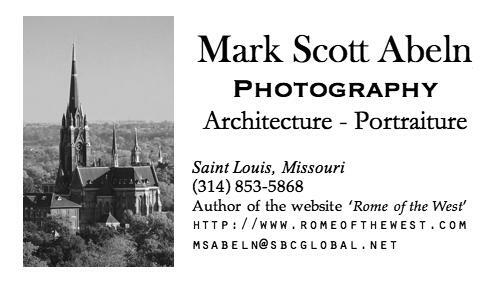 Good art and good architecture are not hard to come by, they simply require an act of the will, and a denial of what the world wants. Modernism was long felt to be inevitable, and even if we didn't like it, many thought that there was no choice in the matter. Most of A-B's newer breweries are of utilitarian design, and so largely lack charm. Cost was often cited as a reason for accepting utilitarianism in industrial design, but this is a bogus argument; for art was never considered in the first place — even though making new company buildings decorative was actually a corporate mandate. A major problem, I think, is that contemporary technologists tend to have only a vocational and not a liberal education, and therefore never get a chance to develop a high sense of beauty, family, community, and harmony, which are greater things in life. Nowadays, if a technologist gets any college humanities at all, it will be thoroughly politicized and Marxist, having hatred for our traditional artistic and moral patrimony. A former hotel, now an office building. 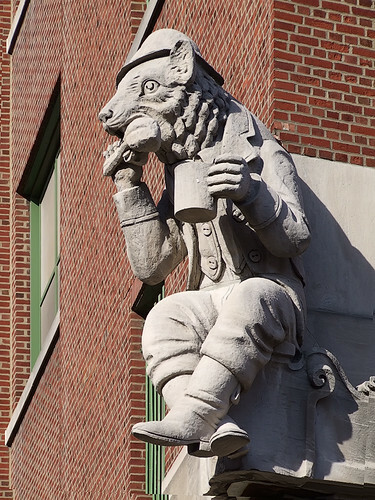 Reynard the Fox, a character from French folklore dating from the 12th century, who loved good food and drink, was the mascot of A-B's near-beer product Bevo. The company promoted its beer as a healthy beverage to drink while having a meal, being a moderate alternative to both hard liquor and Puritanical prohibition. These lessons are being forgotten, especially as vodka and martinis have come back into fashion. On the one hand, we have a trendy resurgence in the booze culture, and on the other, we have extreme governmental intolerance of intoxication; so moderation is lost. Precisely as I was taking this photo, a security guard stopped me for questioning, even though I was standing on the sidewalk of a public street. Of course, he was just doing his job, but for the sake of security the perimeter of the brewery is now surrounded by high fencing. Something is lost; when wealth and power cuts itself off from the people, it alienates itself from society. The former Lyon public school (to the right of the flagpole) is now an office building. Unseen behind the camera is the ten acre Lyon Park. These were named after the controversial Union general Nathaniel Lyon. Missouri was sharply divided during the Civil War, with Progressive, secularist German immigrants radically supporting the Union cause against the pro-Southern older population. 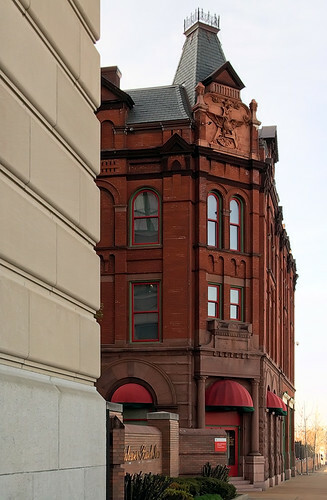 Adjacent to the brewery on the east is the former U.S. Arsenal (at the foot of Arsenal Street, now the National Geospatial-Intelligence Agency). In 1861, Missouri Governor Claiborne Fox Jackson secretly ordered the State Militia to capture the weapons at the Arsenal; instead, Lyon distributed arms from the Arsenal to his own partisans, the Wide Awakes, and attacked the militia on what is now the Saint Louis University campus, leading to the Saint Louis Massacre. The captured militiamen were marched to the Arsenal for imprisonment, being guarded by heavily armed civilian foreigners; this disgrace caused further conflict. Lyon threatened genocide against the population of Missouri at the outbreak of the conflict, and was the first general killed during the war, at the Battle of Wilson's Creek near Springfield. Catholics were mainly caught in the middle during the War. 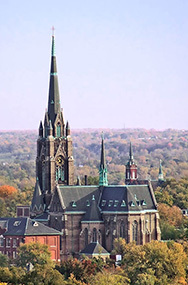 The Bishops in the United States were instructed by the Apostolic Nuncio to remain neutral. This was a dangerous position to take, especially in this war where brother was often set against brother. Archbishop Kenrick strictly maintained this neutrality, despite attacks from both sides: outstate Catholic settlements were annihilated during the conflict by Southern forces, while Catholic institutions in the City were subjected to riots and arson by Northern sympathizers. A brew house, dating from 1992, resembles the style of the older buildings. A few buildings here are empty. Largely due to asbestos abatement regulations, upgrading these buildings for contemporary use is prohibitively expensive, as would be their demolition. Asbestos, while being a health hazard, is excellent for resisting fire, which is an even greater health hazard. 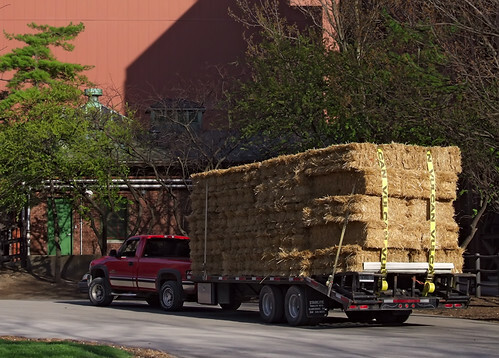 Plenty of hay is for Clydesdale horses. 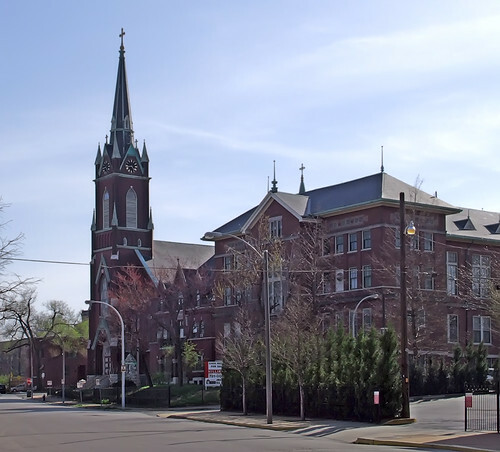 Just south of the brewery is Saint Agatha's church. Once the location of the Latin Mass apostolate in the Archdiocese, it now is the Polish language parish. This was approximately the view from my office window; my office building was a former police station dating from the 1870s, and it too had remarkable architecture. Unfortunately, that structure was subsequently destroyed by fire. The Soulard neighborhood ends just beyond the church, at Interstate 55. The few buildings in the background, once in danger of demolition, have recently been renovated. what no photo of the Wagon and Horses from the side of the building! 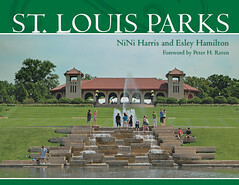 That is a St. Louis landmark too!!! I moved from Missouri to Indiana at the age of 10, 42 years later I still feel like I am from Missouri and I am thrilled with the renewal that St. Louis seems to be enjoying. My Great Aunt passed away this year...she called Little Sisters of the Poor her home and the Sisters there are wonderful in deed!! When I would vistit her and all of her friends there they always referred to themselves by what parish they had attended...Mary Magdalen in Brentwood was her parish. I think your thoughts on pre-modernist factory design are spot on. Great pictures!